With all casualties having been flown out, and the majority of the big expeditions having called it a day, we were now trying to decide on the best way forward. The mountain was temporary closed, and all we could do was wait it out. For how long? No one knew. Sitting around would do us no good. Fitness starts to fade, rumors are rife and constantly being on edge for another avalanche, was playing on our minds. We needed to get out! Sean planned a trip. We would hike down the valley and up to a village called Gokyo. It was a 40km hike or so but apparently a beautiful area. From Gokyo! There were a number of options for a return trip to bc. We packed our bags and got ourselves ready to leave. The Sherpa crew would remain behind, awaiting news on the mountain. After departing bc, we went to Loboche where everyone climbed on to wifi! We had been out of coms fir so long, it was a communication Christmas! For a good 2 hours we all had our heads down, communicating with family and friends and updating blogs! From Loboche, we finally pulled ourselves away from the wifi and trekked on down the valley. We were all in good spirits, chatting away and.reliving the past 4 days events. Each village we passed, we came to see the destruction the earthquake had caused. Particularly ad was Feroche, with many buildings damages, many had even collapsed! With the air getting thicker with each meter we descended, our bodies felt better! Soon it was dark and on we trekked enjoying the scenery, the moment. 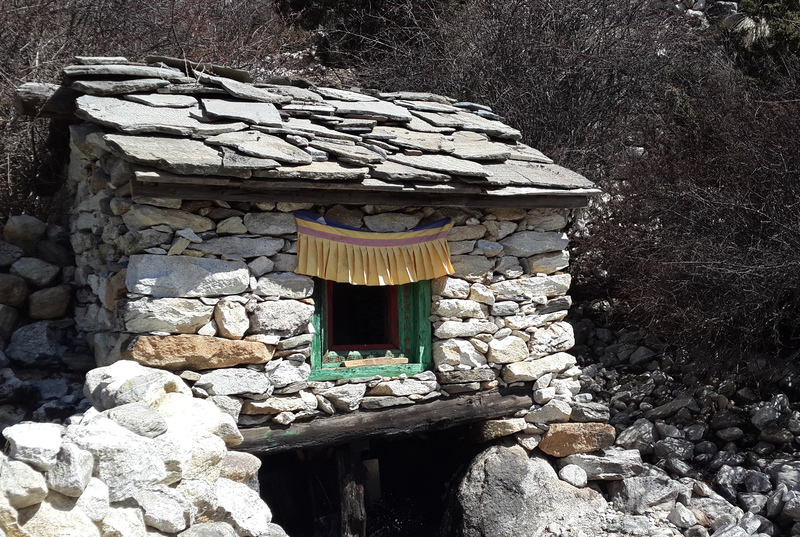 At about 8pm, we entered the village of Pangboche and found a lodge. Bed time after a long days hike! From Lower Pangboche we climbed up through a stunning area and shortly thereafter entered the village of Upper Pangboche. It was surrounded by Birch trees and was typically terraced. In the center of the village was a monastery. Unfortunately we needed to press on and we left Pangboche and started on a contour path. For hikers that suffered from vertigo, this path was a no no! It contoured the side of a hill / cliff, extremely exposed and a drop to the river below of 500meters! Scary, but worth the walk. Scenery like I have never seen before. After 2 hours or so, we came to the village of Portse, we slowly made our way down to the nearest tea house. On entering we heard the familiar chatter of Afrikaans. We had fellow South Africans in our company. After initiating conversation, they were out trekking the area as family. We were asked if we had come across a guy by the name of Nico Oosthuizen, a friend they part knew from home. Well, speak of the devil as Nico stepped forward!! For the next hour we chatted away on the past days events, good to be in company of fellow saffas! Leaving Portse we made our way down to a river, crossing it, and then the pull commenced! We were now making our way up a valley in the direction of Gokyo, and it was all uphill! Fortunately we could revel in the scenery! We were in Trekkers paradise and savoured the moments, albeit huffing and puffing! We stopped off at tea houses and drank lemon ginger honey tea, snacked and chatted the afternoon away. That evening, with the mist and snow making an appearance, we checked in at the village of Mochemo There were quite a few people in the communal living room all because of wi-fi and Sky TV!! Having been at base camp during the avalanche, many wanted to know all about it. We also caught up on the Sky news broadcast. It was at this stage that we began to learn about my hit video clip! It had over 13000 hits on Facebook, was all over the news and even featured on CNN! Sean decided I was more popular than Elvis and began referring to me as Elvis!! Wow, it was kinda weird to know that 2 of my video clips had gone viral and that the SA team at Everest was making headlines throughout SA, and even the world! Crazy stuff!! Next stop – Gokyo! This area is renowned for its lakes. Gokyo overlooks a huge lake, with a number of smaller ones around. On the way up, Sean and I walked together with the rest up front. In true Sean style he said to me, “hey, let’s take a dip!” Now we at 4600m, there is snow everywhere and cascading out of the mountain, is this river! Rarely one to say no, I stripped off and we both took the plunge! Well not a true plunge as it was shallow, but enough to get a pic in the water with snow all around us. exhilarating! The lakes were stunning, although completely iced up. We even saw a duck in a small pond. Lost? At Gokyo, we checked in spent the afternoon debating the way forward. To Sean’s point, the mountain was not closed. We had not had our camp wrecked and all logistics were in place to continue the expedition. Yes, we had experienced a life threatening avalanche. Yes, the team was rattled, and maybe heads were not in the right place, but the team was good to go. Life is about overcoming adversity and obstacles quoted Sean. It’s about the will to overcome, get up and continue. If the mountain was going to open, the SA team needed to be ready to give it a second chance! The other view was we had been given a second chance. We escaped possible death. The mountain had spared the SA team. Others were flocking off the mountain for various reasons. Maybe we should be counting our lucky stars and getting the hell off the hill! 2 views, both with merits! The team got behind Sean’s call. We would continue until a final call had been made on the mountain. Sean and the 3 climbers were going to traverse a pass just above Gokia, and head down to Namche for a day or 2 rest. I decided to head back down the valley, stopping when I felt lie it and leaving the 4 to bond as a team. The long walk, and pass, to Namche, was not top of my priority list just then! Next morning, I headed off back down the valley alone, whilst the climbing 4 headed up towards Renjo Pass. In summary, I spent the next 3 days totally alone, trekking through the most wonderful scenery! I was in no rush and frequently stopped at a river or path bend and ate snacks and drank Game. Being “patmalone” in the Himalayas, not a soul around was a wonderful experience! On the “vertigo” contour path I met 2 Sherpa youngsters. They were studying in Kathmandu and because of the earthquake and risk of disease, they decided to return to their home village for a month or so. We struck up conversation whilst walking and they invited me back to their village and home. Their father was a famous Sherpa and had summited Everest 9 times! I took up their offer and was invited in to their home in Upper Pangboche. What a wonderful experience. Their home, and that of most Sherpa families, consists of one huge room. Everything happens here. The kitchen, living area and sleeping quarters – all in this one room. Downstairs was the barn where the yaks lived. It was an old house, built by their grandfather when he was young. Their grandmother was still alive and at 93, was still active in the home! I was then taken on a tour of the monastery. Sadly, the Lama and his team were in Kathmandu for the “death ceremony” obviously for all those who had succumbed to the earthquake. One on one I was taken to every room in the monastery and the various statues and Gods were explained to me. Apparently it was the oldest monastery in the Khumbu valley. In a locked box was a had and skull! When I enquired on it, I was told it was from the Yeti! Unfortunately in the 80’s or so, the original was stolen. This was a replica, made up by a foreign organisation to replace the one stolen! With time running out, I needed to get going. Sonar, showed we the way out, taking me up to the place where the bodies of the dead were burned! Apparently horses are also burned in a similar fashion, the only other animal to do so! Time to move! We said our goodbyes and I headed off, chaffed that I had experienced time with a Sherpa family. Putting my head down, I made it all the au to Deboche, arriving at about 6pm. A long day and a climb of over 1km vertically. Sadly, that evening after a Whatsapp chat to family back home, I handed my cell phone in for charging. An hour later, I tried to fire it up. The screen had gone, perhaps busted by the extreme cold for the past 4 weeks. My Whatsapp coms with home was over! Tomorrow I would be back in base camp and hopefully able to get some news on the mountain! ← Avalanche at base camp! Are we still on the same planet? Your experiences seem other-world! Hope nothing (for B’s sake) is endangered by the icey dip! Looking forward to a trip to the berg this winter(with fire and red wine) to tease out some of the finer points of your achievements and comments. No question- the Friends of the Library- at kloof also await your story – illustrated i hope with photos. You have done what I only dreamed of doing – many thanks Rob for your perseverance and courage. you make us all proud!